Free resources! Not only is there a list of resources on his website to help you get started with this, but they are all free!! Thank you, Griff! The Insurance Institute for Highway Safety has put these videos up on YouTube, so now you can show them for free as well! There are two videos: Understanding Car Crashes: It’s basic Physics and Understanding Car Crashes: Where Physics Meets Biology. 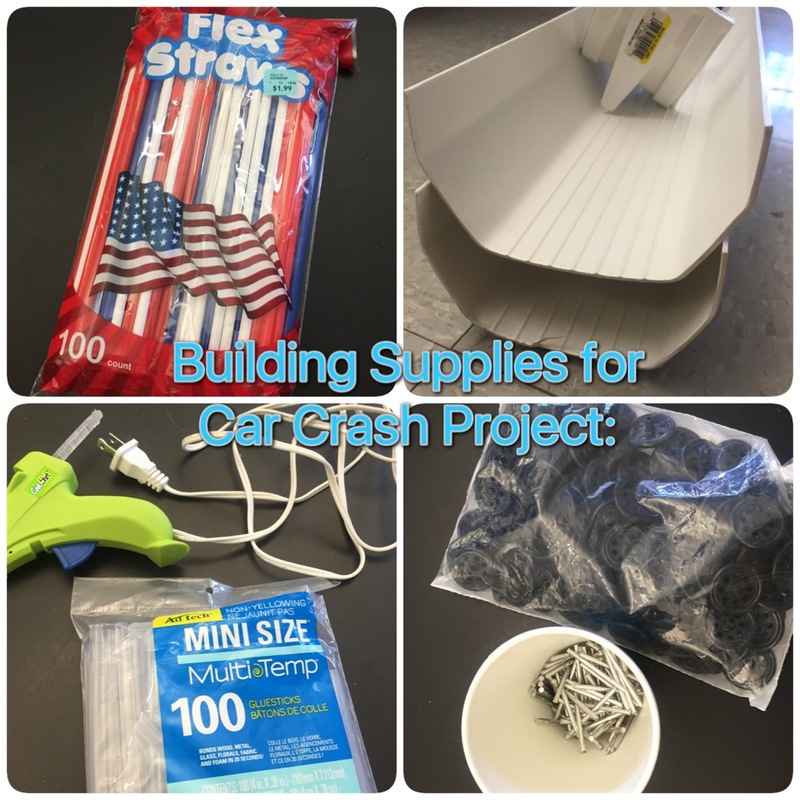 My supplies: Straws, rain gutter, hot glue guns (I had 6 for my classes of 32 to share) and LOTS of glue sticks, wheels and axles (ordered from Pitsco as suggested in the resources). Timeline: I didn’t have as much time as Griff suggested for this project. We started this on a Tuesday and tested them the following Monday. With my 8th graders, they were already starting to lose focus at the end because it was so close to the end of the year and their graduation. So, I’m glad I shortened it. I think for High School students a longer timeline would be fine, but for younger students you need to modify the timeframe. DAY 1: We watched both of the videos from the Insurance Institute for Highway Safety featuring Griff Jones. I told them that these videos were their research and that the information they learned from them should help to inspire their car design. The information presented is dense, and you will want to pause to explain and answer questions frequently. This film is also very visually engaging and kept my students quiet throughout the duration (and that’s saying a lot seeing as they are 8th graders!). DAY2: Today they spent their time brainstorming ideas for their car with their partner. They had to have measurements specified and a detailed plan for what they were going to do with their materials (2 pieces of paper and unlimited hot glue) to maximize the safety of their egg, taking into consideration what they learned from the videos. DAY 3: Students showed me their plans for their car and with my approval received their materials and were allowed to start building (Some students were ready to start building on day 1, but others needed more time). This was a great opportunity for me to check in with each group and give them helpful feedback to ensure they were headed in the right direction with their cars (no pun intended…). DAY 4: Students continued to build for the entire class period. They needed little help or instruction from me on this day. I mostly managed the materials and helped to trouble shoot problems with them. Crash Test Day: I had the crash site set up behind my desk in the front of the room. Since it was a spot not easily viewed by all students, I set up my document camera so that it was facing the crash site and zoomed in enough so that all students could view it on the “big screen” at the front of the room through my projector. I laid plastic down on the ground and against the wall to help contain the raw eggs. 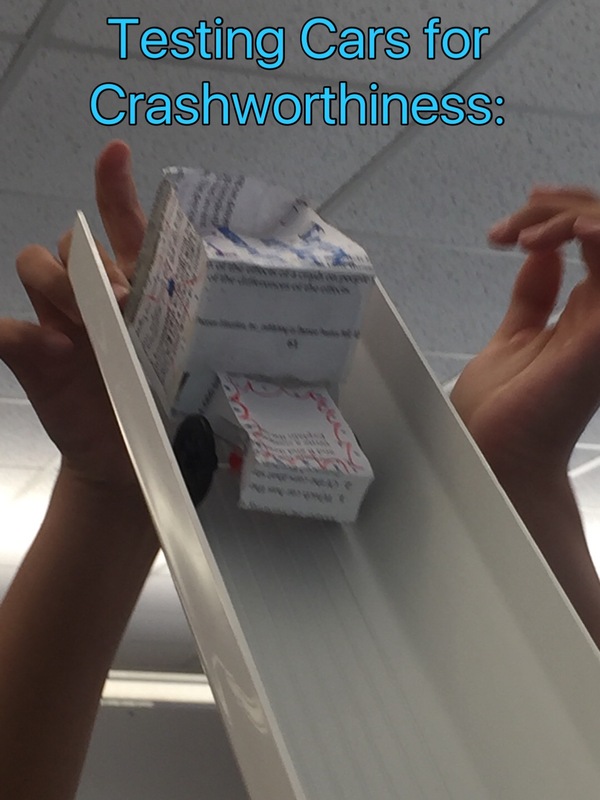 When it was a team’s turn to test their car, they would bring their car up to the crash test site, put the egg into their vehicle*, the class would count down 3..2..1..and they would let it go! I would inspect the car and let them know if their occupant had sustained an injury (cracked shell with, no leakage), a fatality (broken, or cracked with leakage) or the occupant had no injury (egg completely intact). 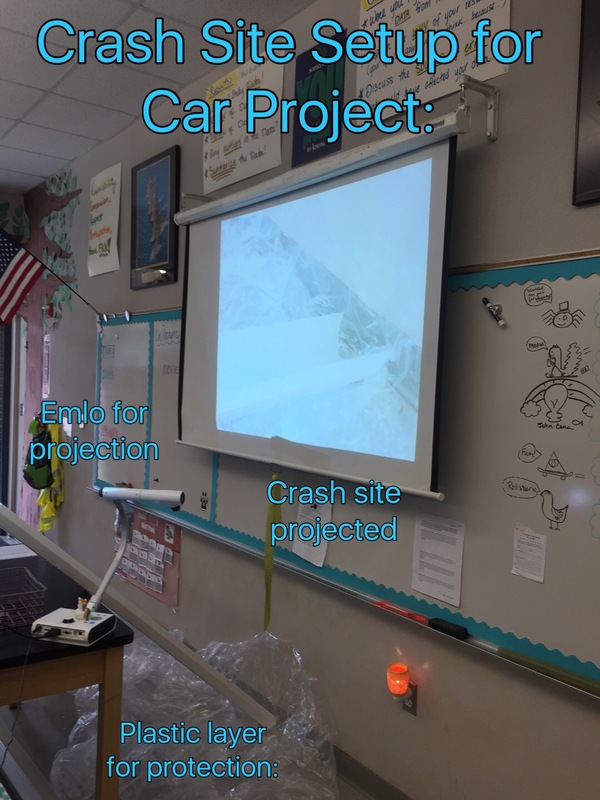 Having the Elmo project the crash site on my screen was great for the whole class getting to see the “results” of each crash test and keep them focused while other teams were going. *after handling the eggs, I had my students use hand sanitizer. I think most eggs are safe to handle these days before they are cracked, but I wanted to be safe just in case. Salmonella is no joke! The Results- overall, they did well! 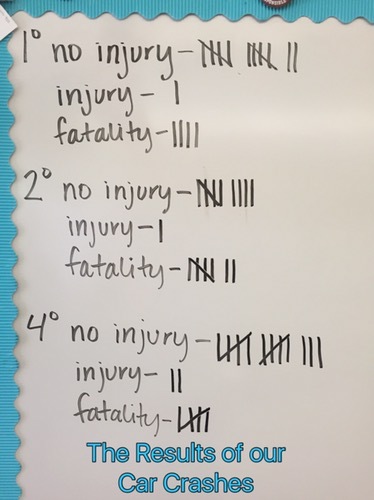 It was about 63% uninjured, 3o% fatality and 7% injury. It seems they either succeeded at keeping their occupant alive or failed completely. Not many occupants had injuries after the crash. My students absolutely loved this activity! The general lesson of vehicular safety really seemed to stick with them too. When we were on a bus a few weeks later, some of them were being a bit squirrely and I reminded them about the car crash videos and the fact that buses don’t have seat belts and they all stayed in their seats facing forward for the rest of the drive. Now, hopefully they remember this when they start to learn to drive next year. Let’s not forget that car accidents are the number one killer of teens. I think that statistic makes this lesson all the more valuable for students who are nearing driving age, or currently driving. I hope this post has inspired you to try out this lesson (or some iteration of it) with your students! So the ones who had fatality in the 1 degree crash. Were they able to participate in the next crash at 2 degrees? Did you just put in a new egg? Thank you! Hi Mary, thanks for the question! Each group only got one try with their car (and one egg). The angle of the ramp did not change either; they just put their egg/occupant I to the vehicle and let it go down the ramp. I hope this answers your question! I think Mary assumed that the “1•, 2•, 4•” results were for the same class period. I was confused at first too, but am I right in saying that those are the results for your 1st period, 2nd period and 4th period classes that day? Ahhhhh yes, Scott. Thank you for clarifying! Yes, they are class periods. Thanks so much for your comment! I am thrilled to know that my words somehow found you through the ether. I will also be at the conference this year and will be sure to stop by and introduce myself to you. 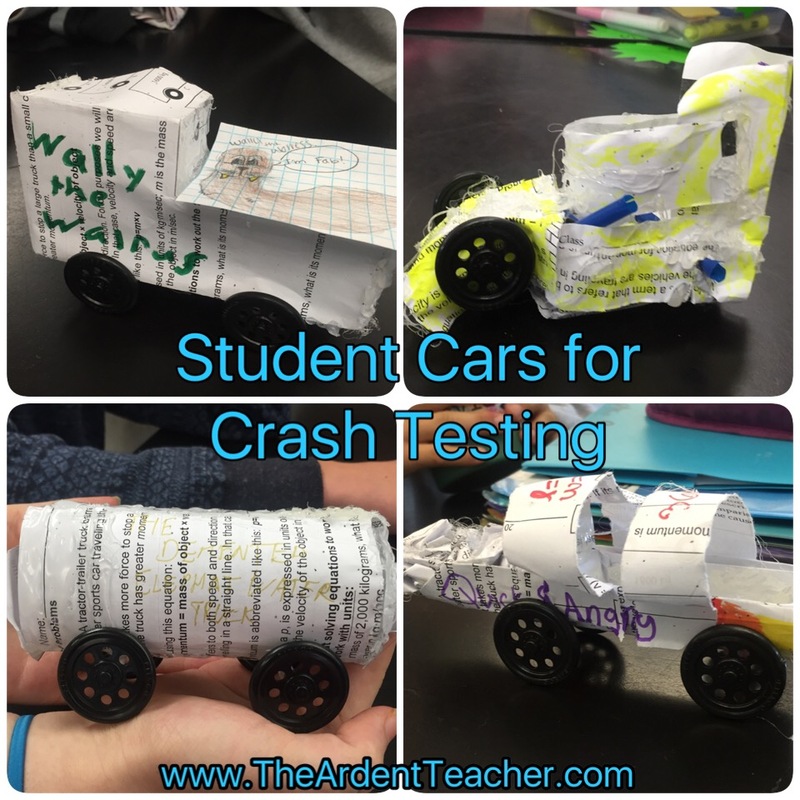 Going to try the car crash project in my high school physics class. Upper class, so we are going to heavily focus on impulse and energy transfer. Just curious, were there any “rules” applied other than can consist of straws and paper and hot glue? I ordered the wheels and axels, but were your axels about 2″? Was there any weight restriction or length restriction? Looking forward to this. Hi Kurtis, sorry didn’t reply sooner! I not give any other restrictions although the actual project calls for a weight specification. I feel they learn more form less restrictions. Good luck!! You listed that you supplied students with straws. Did you have a specific number for each group? What size wheels and axles did you use? I used the recommended sized from Griff Jones (see the link in my post). Good luck! The above link no longer works, any other ideas? I’m not sure which link is not working for you (they worked for me). I would suggest googling “Griff Jones Car Crash Project” and see what pops up. Good luck! 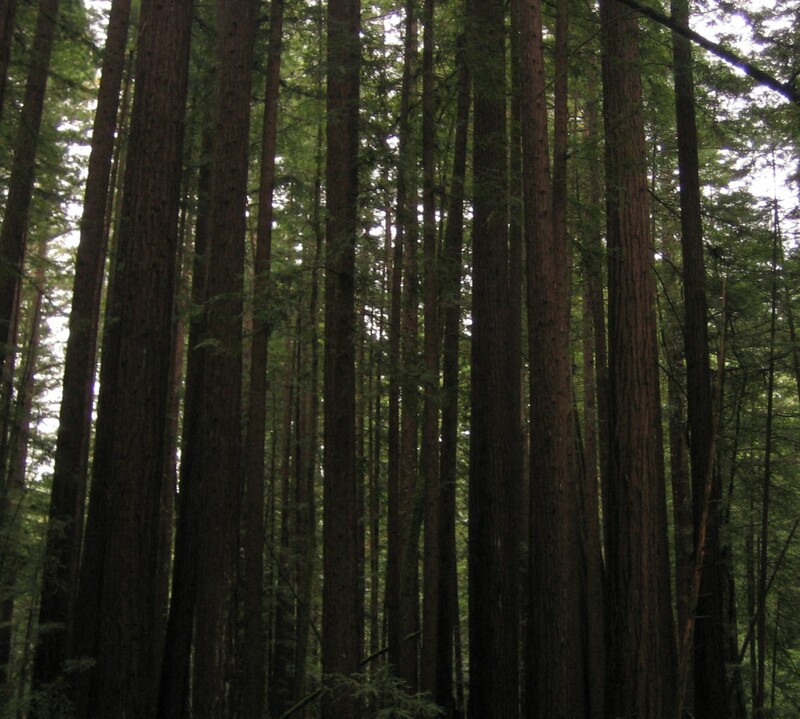 Thanks for sharing your many ideas….I will be using one of them from one of your ‘A stem a day ‘ activities this week. It’s really appreciated! Thanks so much for your comment. I hope that your students enjoy the activity as much as mine did! Bryan, It looks like he may have updated some of his materials – I had to hunt for the older version this year. I use his specifications, but have not figured out how the minimum mass (without egg) is 40g – ours are usually lighter. Yes, the weight is also something I have struggled with. I think I told mine it had to be 15g, which was definitely achieved by most students. Best of luck! I have done this project with my HS Physics students for a few years. Your students will probably have to add mass with additional hot glue. More mass – more momentum – more velocity at the bottom on the ramp. I love this idea and would love to do it with my class. Do you think wooden dowel axles would work instead of the metal ones? Great! I think you should try it! There might be more friction which could work for you or against you depending on the angle of your slope. I am a big proponent of trying new things and modifying. I say, go for it and see if it works!